After much anticipation, 2008 Judo Olympic Gold Medalist Satoshi Ishii will make his long awaited stateside debt when he faces Scott Lighty at “Strikeforce Challengers” on April 1st. 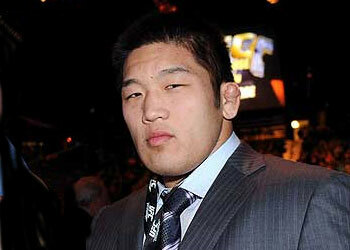 The Japanese star owns a 4-1 MMA record, but has been perfect since his forgettable professional debut. He was last seen posting a unanimous decision win over Jerome Le Banner at “Dynamite!! 2010” this past New Year’s Eve. The event takes place inside the Stockton Arena in Stockton, California. Showtime will broadcast the card beginning at 11PM ET/PT. Another lightweight battle between David Douglas and Caros Fodor was also announced. Tickets go on sale tomorrow, Friday, March 4th at 10AM PT. Seats start as low as $20. Please visit by www.strikeforce.com for details.